Last month, Frans and I finally bit the bullet and bought a Nintendo Switch. Though we tried the system out when it was first released in March, we just weren’t ready to make the, well, switch at that point. But, with new games being phased out for the Wii U that we had, we decided it was a good idea to upgrade. Buying the gaming console is only the first step, though. Next, we needed games to play on it and basic accessories. Let’s start with the accessories. An absurd number of Nintendo Switch accessories can be found online and in stores, but only a few are really needed to get started with. The Nintendo Switch comes with two Joy-Con controllers for either one- or two-player action. If you want more than two players to play at the same time, though, you need to purchase extra controllers. You can always get another set of Joy-Con controllers (about $80). Keep in mind that those have to be charged either on the console, using a more expensive battery pack option, or on a separate charger. Also, those Joy-con controllers are tiny and pretty uncomfortable for long play periods. Since we only have three people in our family and we usually only play with 1-2 people at a time, we decided to get the following. The Pro Controller is so much more comfortable to use for long periods and better for bigger hands. Also has haptic feedback, a motion sensor, is wireless, and holds power for a long time. This is a MUST HAVE for bigger “man” hands! 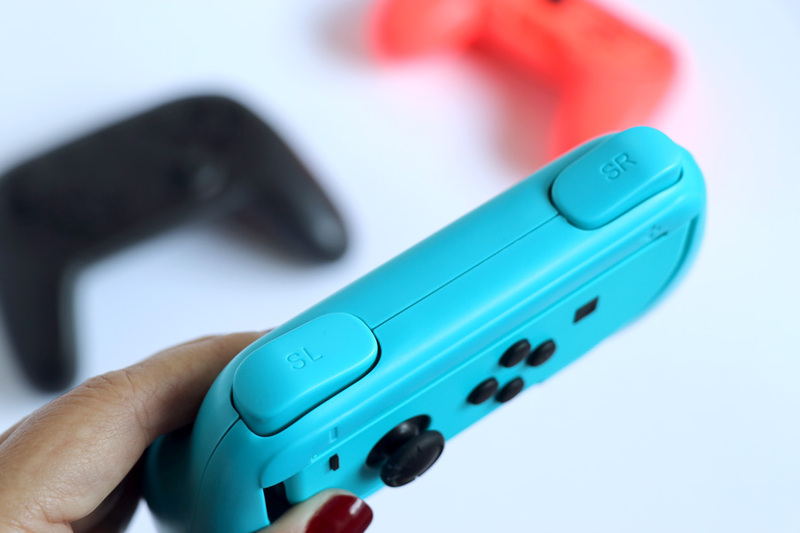 These slide-in grips make the individual Joy-Cons actually usable for adult hands (when turned sideways). Larger L and R buttons allow for effortless drifting in Mario Kart. 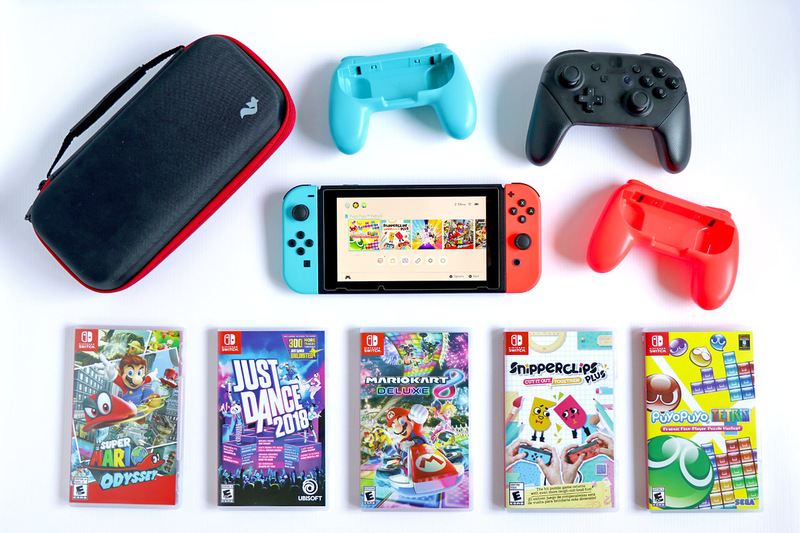 The Nintendo Switch is primarily advertised as a portable gaming system. 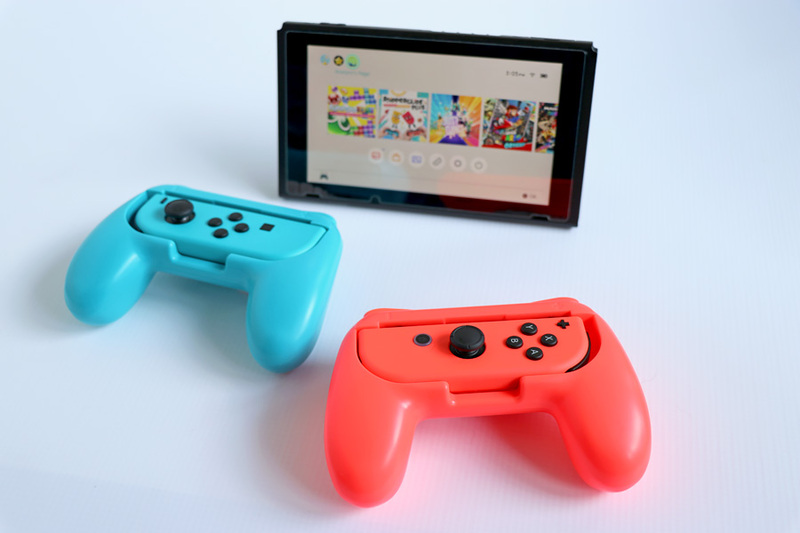 But, if you plan on bringing the Nintendo Switch with you anywhere, you’ll want to protect it with a sturdy travel case that can also hold games. For longer trips, you might want to look into bringing a portable battery pack too (must be USB-C). 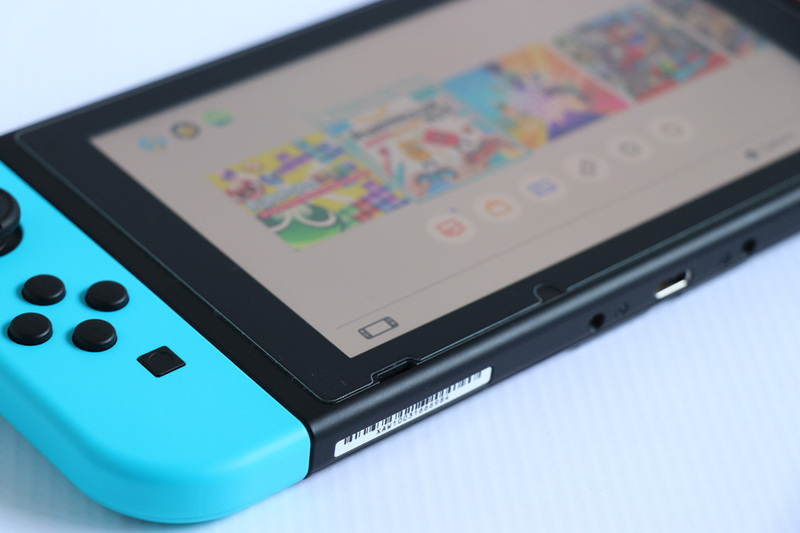 I am a huge fan of screen protectors (always have them on our 3DS systems) and, with online claims that the dock might scratch the console screen (which may or may not be true), I’d rather be safe than sorry. Before even trying to dock our console, I put a tempered glass screen protector on it. It doesn’t hurt and I figured it would protect the plastic screen while we were traveling. Of course, the gaming console will do you little good without any video games to play on it. Several noteworthy games are already available for the Nintendo Switch with many more to come in 2018. Now, your game collection may differ from what we have if you like RPG, sports, or fighting games (people LOVE The Legend of Zelda: Breath of the Wild but I haven’t tried it yet). Also, if you have a membership to Costco or a similar warehouse store, make sure to check their game availability as we found games to be about $10 less than everywhere else. Same tracks as Mario Kart 8 on the Wii U but now with a couple extra power-ups, customizations, and characters. You can also have two power-ups instead of just one. The gameplay is so much smoother! The Tetris levels feed my inner kid, but the Puyo Puyo family battles we have are hilarious and intense (MultiPlayer Arcade, Versus)! The story (Adventure Mode) is super slow and boring so I would skip that use a code to unlock the extra characters and alternate voices. We’ve been playing games from this series for a few years now and I use it for my cardio. There are only a few new songs we like but the fact that Joy-Con controllers “rumble” to the beat is pretty helpful. The game comes with three free months of Just Dance Unlimited. If you have littles, there’s a new “Kids” mode they might enjoy. Snipperclips Plus – Cut it out together! Tons of fun and a lot of laughs figuring out the puzzles. Gameplay can be kind of slow since there’s no real “action” happening. We can only do a few puzzles at a time in each sitting. One game we bought but quickly returned (unopened) was Splatoon 2. We really enjoyed playing this at the release tour event in San Francisco but didn’t realize then that the game is really only one-player. To play with more people, you have to have additional consoles or play online. This is a super fun game but the whole one-player thing was a real deal breaker for us since we got it to play as a family. We’re still getting used to the Nintendo Switch but, so far, we like it. We haven’t experienced any lag when playing games, the controllers are responsive, and graphics have improved. It’s also easy to change between tv, tabletop, and handheld modes, though we mostly keep the console docked and play on our home television. I can’t wait to see what 2018 will bring for new Nintendo Switch accessories and games (especially the Yoshi one). 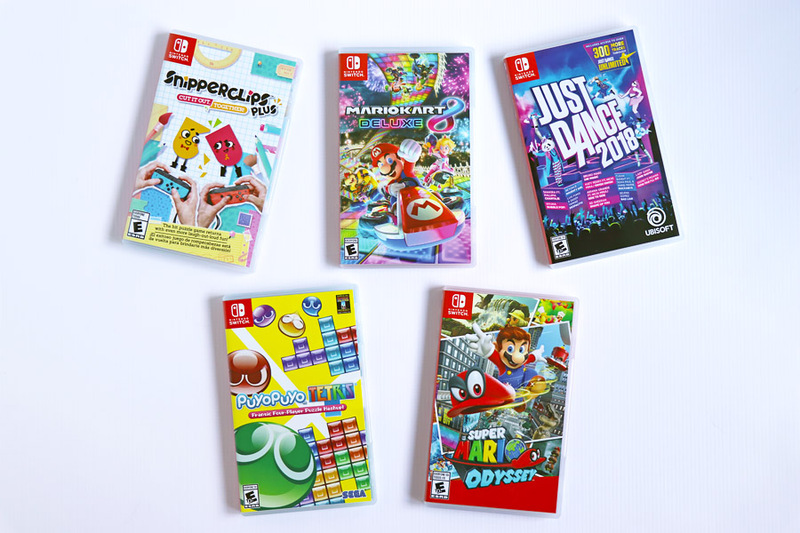 What are your top Nintendo Switch must-haves?